On Sunday afternoons I often get the urge to bake or cook or just do something in the kitchen besides dishes. The weekend has slowed down to a crawl and around 3 or 4 in the afternoon I know it’s too early for dinner but I just want to be in the kitchen. I’m also getting thirsty for a glass of wine. This recipe satisfied both needs and I ended up with a pre-dinner nosh that ended up being dinner. 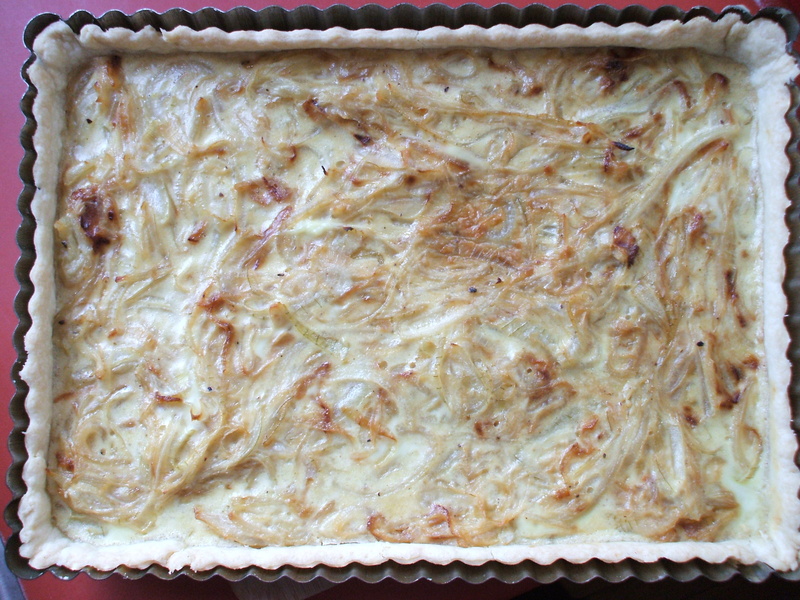 It sounds weird but I have thought about cooking an onion tart for at least two years. The idea of a rich and creamy onion pastry with a glass of cold white wine has always sounded appetizing. It sort of disappointed though and with just two of us to eat it the leftovers looked positively depressing all gummy and cold for lunch on Monday (I’ve honestly thought about having a child just to eat leftovers so I don’t have to).